Team Sweden, silver medallists at the 2009 Worlds, have a new coach, Tomas Nordin, who played in five World finals, winning 3 times at 3rd for Peja Lindholm. "It's interesting to enter a new role, and take on a new challenge," said Tomas. "I know regular curling, and think I have things to add also to wheelchair curling." Hans Säfström, head of sports at the Swedish Handicap Sport Association, added: "It's exciting to work across borders; when a excellent able-bodied player steps into the role of coach, we are taking a step into something new." Jalle Jungnel, long time Swedish skip, who won bronze in Torino, took a year off and then resuscitated the Swedish program through qualification in 2008 before losing to Canada in the 2009 final, said that his team is inspired by what feels like a new beginning. "We are already training," he said, "Just us and Anette Norberg's team, though it feels strange to be on the ice when it is 25 degrees outside." As for his team's Prospects in Vancouver: "As you know, it's impossible to predict results, but we have said in team meetings that our goal is to be serious and prepare as well as we can, but still have fun all the way to Vancouver. No joy - no results, that's the way we think. "Vancouver.... well, Canada are obviously huge favourites, but we would like to join the group of 6-7 teams that are chasing them. We are set to go to play in Denmark, September 11, and later this fall we will compete in Norway, Switzerland and Prague." Could this be the answer to Jim Armstrong? I wonder if this move will help advance Sweden's strategy enough to balance off Canada's big advantage? Will have to help on the long term, but no major improvement overnight. Canada will be the team to beat. only identifiabl advntage for Canada is Jim Armstrong, but will he be playing this season......I understand he did not attend the Edmonton Camp again. 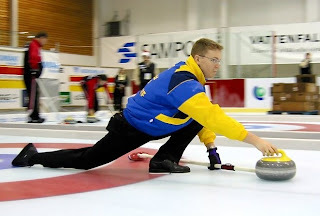 I read on another curling site that Jim Armtrong has had his surgery and is a question mark for the season. Could certainlt re-write the odds for gold in Vancouver. Without Armstrong, what countries step into the favourite role????? The Curling News reported that he had his surgery. I am waiting for a call back on where things stand and will post more when I hear. It's his non-throwing arm, so it is unlikely that it will affect his availability. Certainly that was his expectation last time I spoke to him. apparrently he did not attend the last camp, either. Jim wabts to play and WILL play. He would go out there with one arm if necessary. Eric, you indicated in another thread, that Jim's impact in calling the game and playing lead would still give Canada a definitive advantage. Jim has adopted this sport as his own, despite the way he was welcomed prior to his getting cleared for play.